I would love it if I had the wedding band. Still waiting for it to be shipped, don’t know why it didn’t come with the engagement ring. Would like to know what the hold up is. The picture does not do this ring any justice. It is a beautiful piece, beautiful fire in this diamond. 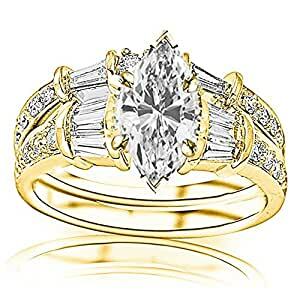 I love this ring , I had it on order and then I had to cancel my order , I was very thankful that Houston Diamond was so understanding and refunded my money quickly . thank you ! The picture does not do this set justice. Its absolutely beautiful!!! !